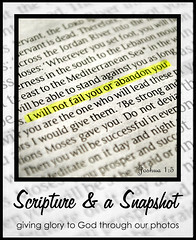 Great picture and verse, Elizabeth! It is a true comfort to know that He is with us all the way, especially during those days when we don't feel His presence or direction! We still can count on Him!I like the part where it says "He "delights" in every detail of our lives!" Sometimes "I" don't even delight in every detail of my life! But He does. This is absolutely beautiful! :D I love that verse and such a fitting photo! aww,,, what a wonderful verse and photo! great combination! hope you cab drop by also, thanks! What a promise!!! Thanks for this I need it this week. What a lovely picture...and a great reminder of what I always need to remember! What a great photo to go with that scripture. And the fact that it is a child, for some reason, just makes it even more clear and true.